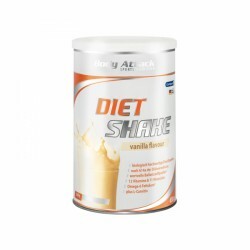 The Body Attack diet shake is subject to the provision of the law of diat regulation (DiätVO) and takes a special status in contrast to many other food and nutritional supplements. Corresponds to requirements of the §14a of the diet regulation, that no undersupply of nutrients happens during a diet. Only 826 kcal per daily ration (= 5 portions) !